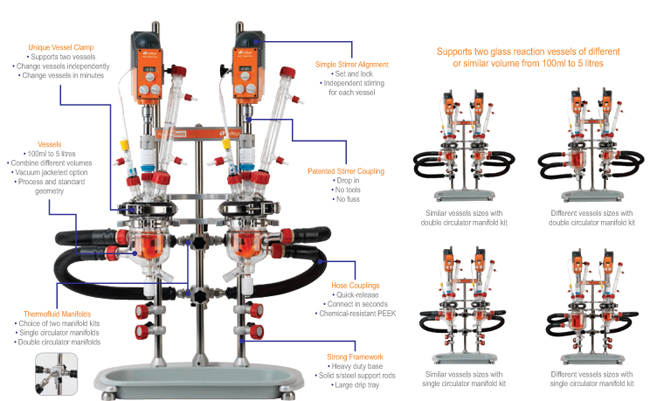 Reactor-Ready Duo shares the same unique features as Reactor-Ready, but holds two independent jacketed glass reaction vessels. The system can be configured to operate with a single thermoregulator controlling the jacket temperature of both vessels simultaneously or with two thermoregulators controlling the temperature of each vessel independently. Rapid exchange of both vessels independently, with quick-release vessel clamp and hose couplings. 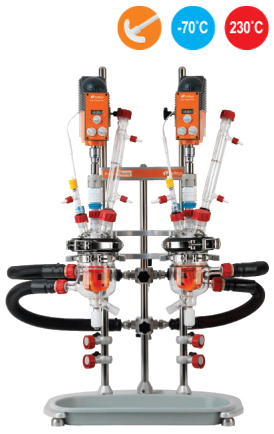 Choice of manifold kits allow two vessels to run from a single thermoregulator or two separate thermoregulators. System accepts two overhead stirrers which can be moved independently. 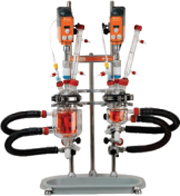 Parallel synthesis or reaction optimisation: use similar or different size vessels and vary stirring speed, stirrer shape and temperature between vessels. Two stage reaction: transfer reactant from one vessel to the other using vacuum or a pump. 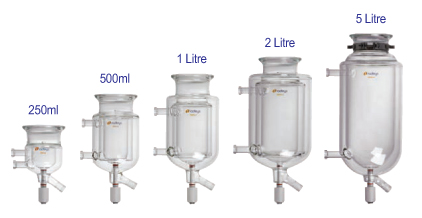 Single reaction vessel: using the second vessel as either a receiving or feed vessel (where reagents can be pre-heated or pre-cooled prior to addition).